The past few days I have been MIA from the blogosphere because I went down to stay at Suzy's house for a few days. We had a good time, played some Wii, golfed, his a card shop, and a Target. We can't possibly hang out together for days without going to a Target or a card shop, or both. The local shop that we went to is more of a store that sells local team merchandise, autographs, and team knick knacks. They have a couple of hobby boxes behind the counter, a few game used cards and autos in a case, and some binders/boxes with cards. Nothing great in the case, so we flipped through a binder and we picked out some cards, well I picked out a bunch- even some for a couple of fellow bloggers in case they needed them. 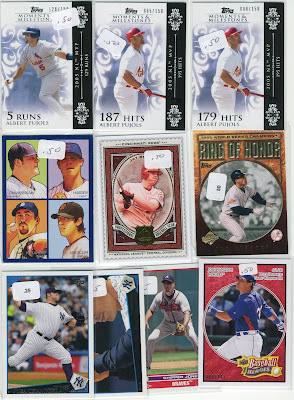 There were no Jeter cards, and very few Pujols in the mix. Not a single Cano either now that I think about it. Long story short, all the cards in the scan cost me $4.25. I think I did ok even if I don't need those M&M Pujols, I couldn't pass them up for 50 cents. I got a whole ton of trades and things in the mail today. Not going to the post office for a few days definitely paid off for some boredom now that I have no one to play Wii with. (sad face here) I got a bunch of Pujols cards from one of our readers, McCann Can Triple. There was also a random package from Waxaholic which made me happy, as well as a box of OPC goodness from Stale Gum and a sweet package of posters from the National from Dan over at Saints of the Cheap Seats. While I don't know how I got so lucky to find a great group to trade with and talk to on a somewhat daily basis, but it is awesome and I am grateful for it.